Four Broward County men who dressed as women during a string of armed robberies throughout Florida and into Georgia have been convicted on multiple charges, prosecutors said Tuesday. Jerome Simmons, 31, Adrian Hardy, 34, Christopher Brinson, 33, and Emmory Moore, 34, were convicted by a federal jury. Four Broward County men who dressed as women during a string of armed robberies throughout Florida and into Georgia have been convicted on multiple charges, prosecutors said Tuesday. Jerome Simmons, 31, Adrian Hardy, 34, Christopher Brinson, 33, and Emmory Moore, 34, were convicted by a federal jury Friday on charges including Hobbs Act robbery, brandishing a firearm in furtherance of a crime of violence and conspiracy to commit Hobbs Act robbery, according to a news release from Ariana Fajardo Orshan, U.S. Attorney for the Southern District of Florida. Hardy was also convicted on four counts of kidnapping. 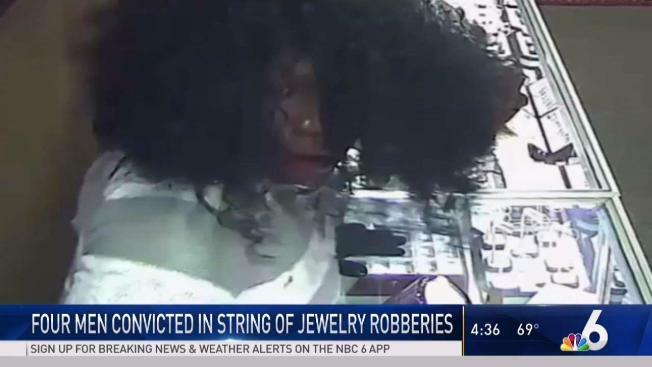 Prosecutors said Moore and Simmons wore wigs, makeup and women's clothing during a March 3, 2017 robbery of Class Jewelers in Deerfield Beach in which they held two employees at gunpoint and stole jewelry and other items from the store with the help of Brinson. Days later, on March 6, 2017 in Spring Hill, two men dressed as women robbed Lily’s Jewelry at gunpoint, prosecutors said. One of the suspects dropped a cellphone, which was later tied to Moore, and cell site information showed that cell phones owned by Simmons, Hardy, Brinson and Moore traveled to Spring Hill, prosecutors said. 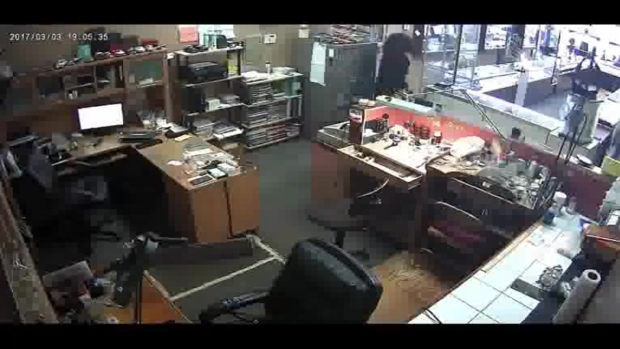 RAW VIDEO: Authorities are seaching for robbers who dress as women during armed robberies in Broward County. Cell site information also showed that their cell phones traveled to Valdosta, Georgia on March 31, 2017. The next day, three men dressed as women robbed Bishop’s Jewelers in Valdosta, stealing money, jewelry, and a firearm from the store’s safe. The firearm was later recovered from the trunk of a car driven by Moore by Fort Lauderdale Police during a traffic stop. On April 16, 2017, three men dressed as women robbed LSO Jewelers in Port St. Lucie. Authorities responded and Port Saint Lucie officers located Simmons in a nearby hospital parking lot wearing only his underwear and a sock, prosecutors said. Brinson was located at a nearby restaurant but Hardy escaped into a nearby retirement community and held four residents at gunpoint for several hours, eventually forcing them to drive him from Port St. Lucie to Fort Lauderdale, prosecutors said. Sentencing is scheduled for June 7. Simmons, Hardy, Brinson, and Moore face up to 20 years in prison for the robbery and robbery conspiracy charges and a consecutive mandatory minimum term of 7 years to life in prison for each conviction for brandishing a firearm during a crime of violence. Hardy also faces up to 15 years in prison for each of the kidnapping charges.